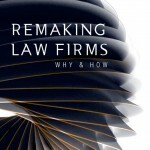 In Partners cannot say they weren’t warned Barry Wilkinson reviews of Remaking Law Firms: Why and How?, a book which looks ahead at the changing shape of the legal services market, and predicts a future in which the business models of successful law firms will have changed significantly. Remaking Law Firms should be standard reading for anyone who is, or intends to be a partner (or owner) in a law firm of any substance in the next 10 to 15 years, putting their own money at risk. It is mainly directed at large commercial firms (BigLaw) but it has implications for firms of all sizes.